Having been first released in 1960, it still holds a quirky kind of charm. (When ever that song airs I say I hate it, but never turn it off.) Every Christmas, Dominic makes an appearance on the radio and now even on Facebook. 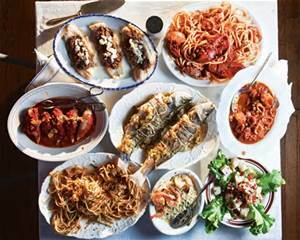 Then, of course, there are the countless photographs of cookies, cakes, eels, sea food recipes and menus for the seven fishes of Christmas Eve. The holiday comes and there we are, flooded with photos of houses illuminated with today’s Christmas trees, trees of bygone times, videos of children opening up gifts, dining tables loaded with food, etc, etc. One photograph in particular on an Italian-American site made me cringe and it is probably the reason I felt compelled to write this essay. An Italian family was seated around the holiday table with the men smiling broadly and the women (who looked as if they had been coifed by the ‘hair fairy’ who lost her comb) hovering nearby. The men were wearing their athletic white undershirts. That got to me! Did your mother let her male children or relatives dine on a holiday in their undershirts? Never saw this before! 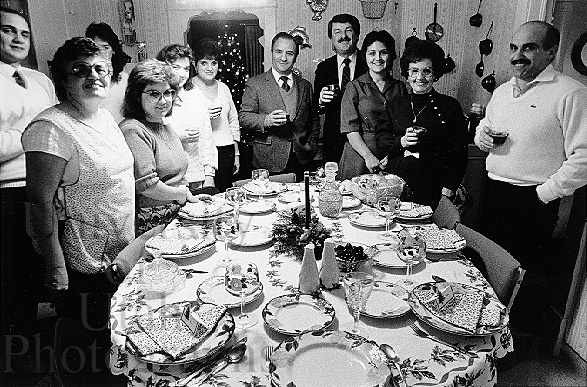 What an image to project as being typical of the Italian-American holiday table. Growing up in America one gets the notion that only the English knew about etiquette – the rules of comportment on social and casual occasions. Emily Post’s etiquette book, which was released in 1922, is virtually in every home. Ignored is the fact that every country had its standard of proper comportment. 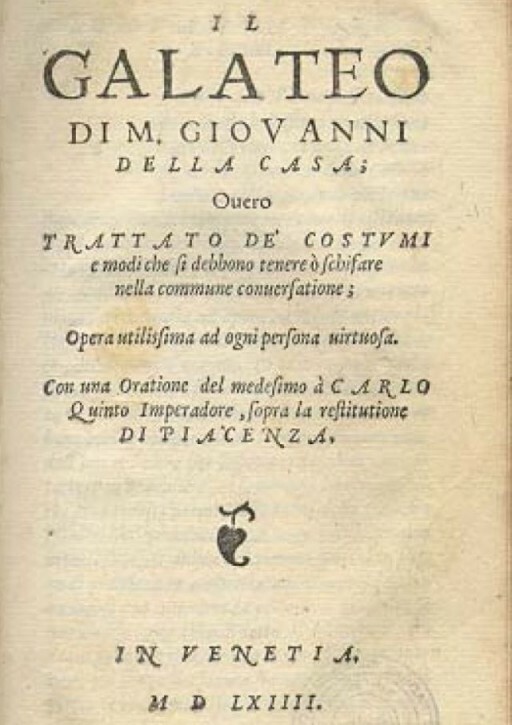 Confucius laid the laws down for the Chinese while the Italians had two men – Castiglione and Della Casa. It is from Castiglione that we learned the expression “fare una bella figura.” He advised you always should look the part, even if you fell short on a number of the fundamentals. When one leaves the house today, ‘fare una bella figura’ comes with us. In the 16th century, Giovanni Della Casa instructs how the gentleman must comport himself among his peers and lower classes daily. He’s the Emily Post of his time, focusing on decent everyday behavior at home and in the street. Like Emily Post he encourages consideration of others’ wishes and sensibilities. He gives advice on hygiene, toileting, table manners, and proper dress, so as not offend. I’m sure Della Casa would not approve of undershirts at the dinner table. Conversation should avoid vulgarity, blasphemy, and they not be too exoteric or cause embarrassment to others. The use of knife, fork and spoon while dining is a must and chugging your drinks is a definite no-no. Of course, let’s not forget he was the first to say no teeth-picking or beard picking at the dinner table!